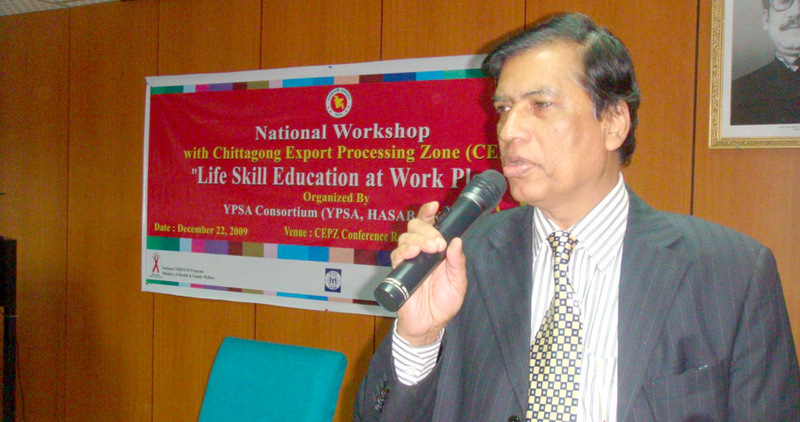 YPSA- GFATM Package 912 National Workshop titled “Life Skill Education at Work Place” with Chittagong Export Processing Zone (CEPZ) was held at CEPZ Conference Room, Chittagong on 22 December. YPSA Consortium Advisor Prof Dr. A Q M Serajul Islam, Ex. Head of Department , Dermatology & STDs of Chittagong Medical College has chaired this workshop. Md. Ataul Hoque, General Manager, CEPZ was present as the Chief Guest. Director (In-charge), CEPZ Hospital Dr. Md. Abu Taslim was present as the special guest.